Stock photo of Shark Mask by Stan C Hunt, Kwagiulth First Nations Artist, original West Coast native art, Just Art Gallery, Port McNeill, Northern Vancouver Island, Vancouver Island, British Columbia, Canada. 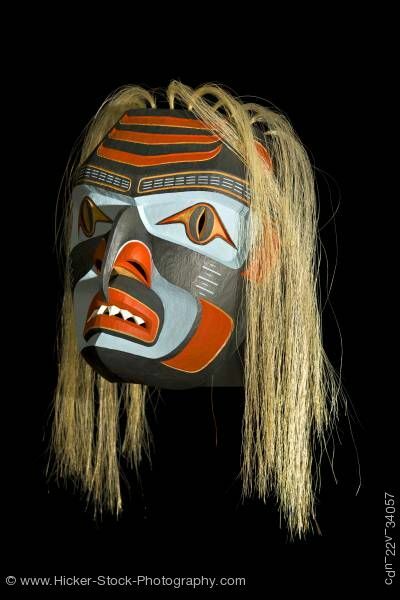 This stock photo shows a Shark Mask by Stan C Hunt, Kwagiulth First Nations Artist, original West Coast native art, Just Art Gallery, Port McNeill, Northern Vancouver Island, Vancouver Island, British Columbia, Canada. Stan C Hunt comes from a Kwagiulth family from Fort Rupert, British Columbia on Vancouver Island. His grandfather, Mungo Martin is widely credited with saving Kwagiulth art from extinction in the early part of the century. His father, Henry Hunt, was a renowned master carver who worked at the Royal British Columbia Provincial Museum in Victoria for many years. His older brothers, Tony and Richard Hunt, are among the leading artists in the Kwagiulth form. A fine example of Master Carver Stan C Hunt this has all the gills and detail cleanly carved with the eyes, noise and teeth being carved through and finished off with horse hair. This mask measures 10 inches high by 9 inches wide and is 6 inches deep.